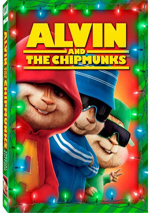 Chipmunk singing sensations Alvin, Simon and Theodore are back for an encore in this hilarious "squeakquel" packed with more action and more nutty fun for the whole family! When a concert mishap lands Dave in the hospital, the Chipmunks take a break from superstardom and enroll in school to fit in with kids their age. But they soon face some stiff competition when they meet the Chipettes - a beautiful, talented trio of chipmunks discovered by Ian, the boys' evil ex-manager! $48.875 million on 3700 screens. Back in 2007, Alvin and the Chipmunks came out of nowhere to earn big bucks with a final US gross of $217 million. That set the wheels in motion for a follow-up, so the next chapter in the saga arrived two years later via 2009’s Alvin and the Chipmunks: The Squeakquel. While on tour, Chipmunks manager David Seville (Jason Lee) accidentally gets injured. This sticks him in a French hospital for an extended period. In the meantime, Dave sends the Chipmunks – brash Alvin (voiced by Justin Long), brainy Simon (Matthew Gray Gubler) and innocent Theodore (Jesse McCartney) – home to the care of his Aunt Jackie (Kathryn Joosten). Alvin’s recklessness strikes again, and his shenanigans send Jackie to the hospital as well. This leaves them in the care of Toby (Zachary Levi), her dorky, underachieving grandson. While the Chipmunks get accustomed to life with Toby, they encounter another change: they go to school. There they encounter jocks who bully them and a principal (Wendie Malick) who secretly adores them. She recruits the Chipmunks to represent the school at a high school music festival; she hopes they’ll win the $25,000 prize to save the school’s music department. In the meantime, disgraced former record label bigwig Ian Hawke (David Cross) plots his comeback. He gets a shot at redemption when a group of singing female chipmunks (Amy Poehler, Anna Faris and Christina Applegate) end up on his doorstep. Ian gets nowhere within the industry, so he plots his revenge: he sends the Chipettes to the same high school as the Chipmunks so they can win the contest instead of the boys. Since Squeakquel almost exactly duplicated the boffo box office success of its predecessor, we’re guaranteed one – and probably more – flicks in the line. Ugh. The first flick offered minor fun at best, but the follow-up can’t even muster the smallest of pleasures. Relentlessly stupid and charmless, the movie has nothing going for it. Some would say I shouldn’t critique a flick like this because I’m not part of its target audience. And that’s clearly true: I’ll hit 43 soon, which put me at least three decades past the film’s demographic. But I’ll say what I always say when I review material of this sort: just because a movie shoots primarily for a young audience doesn’t mean the filmmakers can’t create something that also satisfies adults. Pixar proves this yearly, and the best “family movies” offer at least decent entertainment for adults. The filmmakers know that parents will be stuck in the crowd with the kids, so they owe the adults some consideration. And those behind Squeakquel do attempt some jokes that only adults will get. Unfortunately, they’re relentlessly stiff and uninventive. Congress needs to enact a ban on Apocalypse Now-based “I love the smell of ‘X’ in the morning” gags, and other riffs on flicks like Silence of the Lambs prove just as lame. Frankly, the jokes feel gratuitous and without any form of inspiration. Which goes for Squeakquel as a whole. 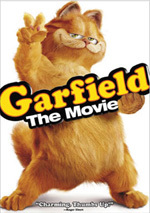 The original movie existed mostly as an excuse to mount a marketing campaign. It’s not like there was any particularly compelling creative reason to relaunch the Chipmunks franchise; I suspect the folks who own the rights just wanted to continue to milk that particular cow. At least the first movie actually attempted a plot and some mild character development, all of which go out the window for the aimless Squeakquel. It offers a collection of sight gags in search of a story. Oh, it includes plenty of subplots, but there’s nothing that carries the flick in an overall sense. It simply hops from one plot fragment to another without the slightest hint of coherence. Look, I don’t expect a great deal of logic from a movie about singing chipmunks, but the filmmakers could work a little harder than they do. Why does Dave send the Chipmunks to school? Darned if I know. I guess this is his attempt to give them a “normal life”, but what in the world constitutes a “normal life” for humanoid rodents? Where did the Chipettes come from? The series seems to set no rules about which animals are anthropomorphized and those that aren’t. Can all chipmunks talk/sing, but it’s other species that lack these qualities? I have no idea, and the movie never attempts to explain this. Again, I understand that I shouldn’t expect accuracy/realism from a film like this, but some internal logic would be nice; I’d at least like to have a vague comprehension of why some animals have these humanoid capabilities and others don’t. Also, if the school needs money, why don’t the Chipmunks just play a benefit concert? They’d make way more than a crummy $25,000 if they went that route. The simple defense would be that the battle of the bands becomes a plot device, but I’d think the filmmakers could’ve come up with some other dramatic element that made more sense. But that’d require the folks behind Squeakquel to actually attempt a creative, thoughtful movie, and that’s clearly hoping for too much. Squeakquel exists as stupid, humorless product and nothing more. Kudos to Jason Lee for somehow managing to mostly stay on the sidelines and away from the “action” in this thoroughly awful movie. Alvin and the Chipmunks: The Squeakquel appears in an aspect ratio of approximately 1.85:1 on this Blu-ray Disc. This was a good but not great presentation. Sharpness was a moderate concern. Although most of the movie offered good delineation, sporadic instances of mild softness cropped up through the film. None of these examples became terribly distracting, but I thought parts of the flick lacked the expected clarity. No jagged edges or shimmering occurred, and edge enhancement remained absent. I saw no source flaws either during this clean presentation. Like the first flick, Squeakquel went with a moderately subdued set of tones. Hues stayed on the natural side, with a mild golden tint to things. Within those parameters, the colors looked fine. Blacks were dark and firm, while shadows appeared clear and well-developed. The mild softness was the main reason this transfer fell to a “B”. Not a lot of action came with the DTS-HD MA 5.1 soundtrack of Squeakquel, as the soundfield stayed pretty subdued through much of the flick. The forward speakers brought out general atmosphere as well as a few minor examples of movement. Elements wound up in logical spots, but they just didn’t have a lot to do. Music showed good stereo imaging, at least, and the surrounds added moderate ambience. A sequence that involved a remote control helicopter was the only one that threatened to use the back speakers in an exciting manner; the rest of the movie stayed low-key. Audio quality was a bigger issue, as the movie suffered from drab sound. Speech seemed fine much of the time, but edginess occasionally interfered with some lines; this was especially noticeable during early scenes with Ian Hawke. Music seemed clear enough, though the score and songs didn’t come with much oomph; low-end was decidedly lackluster and close to non-existent. Effects sounded fairly accurate and distinctive, though they also didn’t pack a lot of punch. This merited a “C+” that bordered on a “C”; I wasn’t at all impressed with the soundtrack. Apparently the suits at Fox assume – probably correctly – that film buffs won’t watch Squeakquel. This means a long roster of kid-oriented supplements, though some of them still offer interesting material. We open with ’Munk Music Machine, a collection of 11 songs from the movie. Actually, this feature simply allows the viewer to jump to the scenes in which those tunes appear. It’s a glorified form of chapter search. For some behind the scenes info, we go to a subtitle track called Music in a Nutshell: Song Trivia. This mostly conveys details about the many tunes heard in the film, though it also throws out a few other details about cast and the Chipmunks franchise. The material aims at kids, so it tends to be pretty basic, but it still covers the topics well. With the “A-l-v-I-n-n-n-n!! !” Album Maker, we can create a collection of Chipmunk albums. This feature allows you to decide on album cover, titles and other elements. I can’t say it did anything for me, but maybe the kids will like it. A few featurettes follow. Munking History: 50 Years of Chipmunk Mischief, Mayhem and Music runs nine minutes, 21 seconds, and includes comments from producers Ross Bagdasarian and Janice Karman and actors Zachary Levi, Jason Lee, Chris Warren, Jr., Kevin G. Schmidt, Wendie Malick, and Anjelah Johnson. 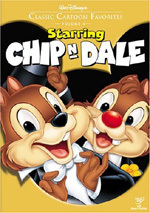 The show includes a few details about the development and evolution of the Chipmunks, but mostly it’s a big old mushy kiss aimed at the franchise. We don’t learn much here. Meet the Chipettes goes for eight minutes, 37 seconds, and provides notes from Bagdasarian, Karman, and actors Amy Poehler, Christina Applegate, Justin Long, Jesse McCartney and Anna Faris. We learn about the origins of the Chipettes, their design, and the vocal performances. Some of this aims for laughs, but we get a smattering of interesting details along the way. For the next piece, we find the six-minute, 21-second Rockin’ Rising Stars. It includes remarks from Bagdasarian, Malick, Johnson, the band Honor Society, executive music producer Ali Dee Theodore, music producer Jason Gleed, and singer Charise Pempengco. “Stars” introduces us to the various young musicians and tells us they’re awesome. It’s promotional fluff, that I must admit Pempengco does a pretty good impersonation of the various Chipmunks. Music Mania lasts nine minutes, four seconds and gives us statements from Levi, Bagdasarian, Karman, Johnson, Malick, Lee, Gleed, Theodore, director of photography Anthony B. Richmond, choreographer Rosero McCoy, animation supervisor Chris Bailey, property master Emily Perry, assistant property manager Joy Taylor, costume designer Alexandra Welker, and visual effects supervisor Douglas Smith. The show looks at all the elements that came together to create the movie’s climactic musical performance. Like the disc’s other featurettes, this one tends to split between fluff and facts. Still, it has enough worthwhile content to merit a look. With that, we head to the nine-minute, 40-second The Chipmunks: Behind the Squeaking. It features Johnson, Schmidt, Malick, Levi, Faris, Poehler, McCartney, Applegate, Bagdasarian, Karman, Long, Lee and actor Matthew Gray Gubler. This offers a mockumentary that views the Chipmunks as real. It offers minor amusement at best. We dissect the filmmaking process in A-NUT-omy of a Scene. The two-minute, 39-second piece provides remarks from Lee, Bailey, Perry, Taylor, Richmond, Levi, Smith, Bagdasarian and Karman. The program gives us a quick overview of how the filmmakers use props to help the actors interact with non-existent animals. We already learn some of this in “Music Mania”, but I like the additional material available here, especially since we get good before and after shots. More behind the scenes material pops up with the three-minute, nine-second Meet the Stuffies! and comments from Warren, Karman, Johnson, and Bagdasarian. This piece treats the stuffed stand-in Chipmunks like they’re real. Yeah, that’s a lame premise, and it’s not a very interesting clip. For the final featurette, we find Shake Your Groove Thing! With Rosero. The eight-minute, 59-second reel shows choreographer Rosero McCoy as he and his dancers teach us how to step like the Chipmunks. I’ll leave it to others to try out the moves, but it could be fun for those with an interest in that material. The disc opens with a few ads. We get promos for Avatar and Marley and Me: The Terrible 2s. Two more clips show up under Sneak Peeks: Tooth Fairy and Space Chimps 2: Zartog Strikes Back. No trailer for Squeakquel appears here. A second disc offers a DVD Copy of Squeakquel. If you want to own Squeakquel but aren’t yet Blu-ray capable, it’s a good bonus. Finally, a third platter provides a Digital Copy of the movie. This allows you to transfer the film to a computer or portable gadget. Krunk! 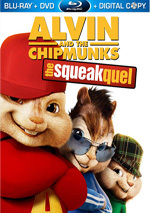 I didn’t expect much from Alvin and the Chipmunks: The Squeakquel, and yet the movie still disappointed. While the original wasn’t good, it provides substantially more entertainment than this meandering, moronic follow-up. The Blu-ray comes with generally good picture, mediocre audio, and a roster of fluffy but occasionally interesting supplements. I suspect the film will still entertain its target audience, but parents who’ll be forced to watch should try to find something better.